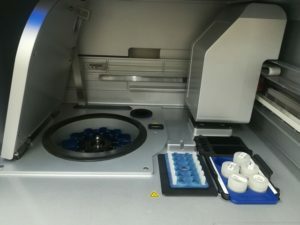 The iMM-Biobank is a safe for keeping biological samples, ranging from saliva to blood (serum and plasma, which is always the most commonly collected sample), tumours, bones or biological fluids (in particular those related to rheumatic diseases), collected with permission of patients, or relatives, with the purpose of supporting scientific studies developed by researchers and physicians. Kept in jars and cabinets, about 200,000 samples are estimated to have been stored. Of the 17,000 donors, 2,000 are healthy controls and most samples are from women. At the top of the three most sought-after Biobank samples are those from healthy donors, while the Neurology and the Tumours collections rank second and third, respectively. Despite ranking first, healthy samples are the hardest to collect, because as people get older, finding totally healthy people in their 60s and 70s is becoming increasingly rare, but they are extremely important for researchers to compare diseases with healthy cases. A small team is responsible for performing the routines and procedures of this valuable Bank on a daily basis. Composed of five people, three staff and two co-directors – Sérgio Dias and Joaquim Polido Pereira – who jointly manage the team precisely because they combine Research with clinical experience. While Sérgio Dias ensures a liaison with the iMM researchers and promotes the bank’s samples, Joaquim Polido Pereira, a rheumatologist at Santa Maria, maintains an open channel of communication with several physicians who work at that hospital. This balance allows the increase of the vast number of samples in a short period of time. 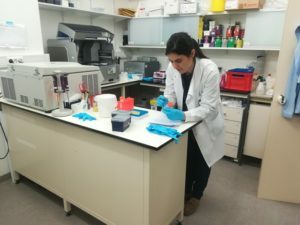 Susana Ferreira, a graduate in Biochemistry with a Master’s degree in Human Biology and the Environment, is responsible for processing samples, entering data, and also for cell culture. Initially, she was only involved in the isolation of peripheral blood mononuclear cell (PBMCs), which belonged mainly to the Haematology collection. However, the primary culture of fibroblasts started being performed to meet the needs of a number of researchers. 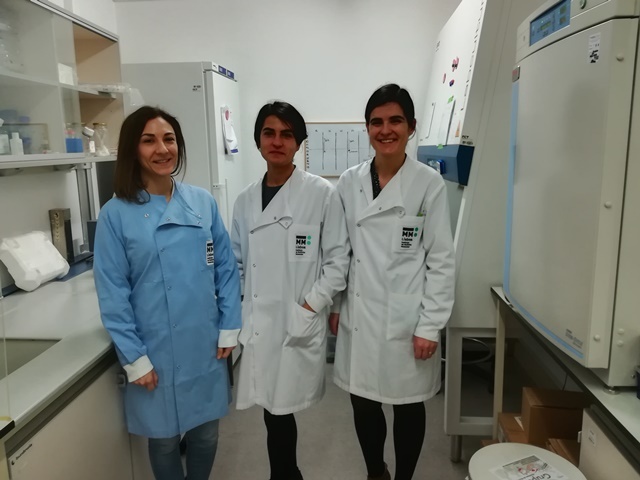 Therefore, and since there was already some experience in cell culture, the protocol for the implementation of primary cultures of fibroblasts was introduced in the Biobank, enabling the creation of a new research support service. Fabiana Rodrigues, the only member authorised to collect blood, represents the most clinical side of the team. She handles DNA, being responsible for extracting it and subsequently for analysing its quality. She is currently doing the second year of her Master’s Degree in Oncobiology and is focussing on enhancing the Bank’s tumour collection by collecting more samples at Santa Maria. When a scientist wants to start a collection, the first person to contact is Ângela Afonso, who has a passion for Biochemistry and completed her Master’s degree precisely in that area. After meeting with the researchers, she tries to understand their interest and that workflow that should be established in order to move forward. 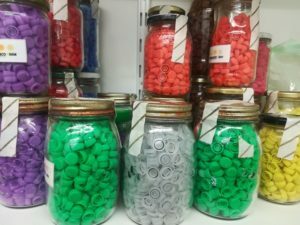 One of her major concerns, right from the start, is the way the samples are stored, to ensure that they will never get damaged and lose their quality. Once the requests are submitted, she manages the communication with the Scientific Committee that will assess the relevance of the proposal for a new collection or sample request. The creation of these collections is usually proposed by a team that may include a physician and several researchers. In addition, the Santa Maria Hospital has an Ethics Committee to which they must respond in order to have the sample collection approved. Ângela has been with the Biobank for seven years and knows the entire process inside out, but the rest of the team also knows how to make collections and submit requests. Biobanks serve as facilitators for research studies, as they don’t have their own research structures. With duly catalogued samples, all the information is strictly confidential and anonymous in what regards the donors. There is a dedicated software that immediately locates what you are looking for in the cabinets. Organised in drawers, the samples are easily identified by different colours (each colour corresponds to a therapeutic area), and the sample boxes are coded in the computer system by means of an address. 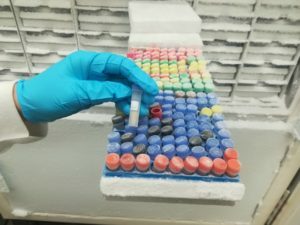 As the samples are properly dosed, each researcher receives his or her own share without having to return it at the end. As there are many different pathologies, Ângela explains that “the idea is to provide a set of samples in a sufficient quantity and quality, which is associated with relevant clinical information to make it easier to carry out studies”. On a guided tour, she explains the various steps and immediate needs, “we collect blood, in many cases approximately 8ml; we only need more according to the specificity of the project. But for our control collection we always use these two small tubes”. One of the tubes will be used to extract DNA and the other one to separate the serum, the liquid part of the blood, “and instead of storing them in the freezer, as we used to do in the past, we are now storing all the samples in aliquots. When we want to preserve the samples with as much stability as possible we keep them at -80 and that allows us to keep nucleic acids and proteins in perfect conditions. But if we want to preserve cells, we have to store them in Liquid Nitrogen containers for cryopreservation, keeping them in that fluid. 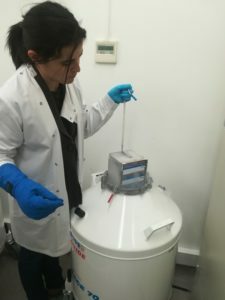 Cryopreservation is a long-term preservation technique that allows storing samples for many years, because the integrity of the cell remains intact”. In addition to being the largest Biobank in the country, it was also the first one to be created, explains Sérgio Dias. “There are several biobanks in Portugal. One of them, which is almost as old as ours, is the National Tumour Bank Network, which started with the São João Hospital in Porto and created large tumour collections. Oncology started there, mainly, but we have a big representation here too, despite not having the major share. Neurology is very important because we have a vast collection from the Santa Maria Hospital, from Professor Joaquim Ferreira (Head of Department), which is related to the issues of movement and allows us to pursue studies on Parkinson’s disease, Alzheimer’s, Sclerosis; it is one of the most dynamic collections we have”. At this moment, the Biobank has virtually reached its cabinet storage limit. “The goal of a bank like this one is not to reach record numbers of samples, but to streamline its collections; it is rotation that streamlines the collections so they can be renewed. Ultimately, the purpose of this study process is to allow researchers to draw conclusions or build hypotheses and publish their papers”. In order to continue enhancing the databases with more and new samples, there is the need to expand the existing facilities and, in addition to the urgent collection of more samples from healthy cases, having new and larger facilities is Sérgio Dias’ top priority. “I should point out that, while the Biobank is a structure associated with the CAML, it was accommodated in the iMM for practical reasons, as it was here that we found the space and the conditions to create the bank; however, it is also associated with the Faculty and the Hospital. But we need new conditions to be able to continue to grow and to ensure prospects for its survival in five years time”. Portugal-Mozambique Conference – Joint R&D Projects. Shall we celebrate Solidarity Day together?